Wordless Wednesday - February Calendar Shot! Hello everyone, and welcome to my weekly entry in the Wordless Wednesday Blog Hop! As you all know, this great series is hosted by my friend Deb from Focused on the Magic, and it features a different Disney theme each week! Since this is the beginning of the month, this week’s theme is the February Calendar Shot — that one shot or shots that you would have on your Disney calendar for the month of February! That trip was a lot of fun, with a great deal of relaxing memories that we remember to this day. It was also, at this point, the last trip that we have taken with just Cindy, Sophie and I being in the party — the next year we took my niece Stephanie, and the party has steadily increased ever since! I hope you have enjoyed this week’s Wordless Wednesday post! As a side note, tomorrow the 6th is my 45th birthday, so while the blog is only about 2 1/2 years old, my Disney memories span back 34 years to that first trip when I was eleven years old. Here’s to another 34 years of Disney Memories! To see the rest of the incredible Wordless Wednesday posts, just click on Deb’s button below and enjoy! That is such a special memory. I hope that I’m able to surprise my kids like that someday, too! What a sweet picture! So perfect for a calendar shot! Love the video and Sophie’s surprise! Thanks for sharing and joining in the DWW Blog Hop fun today. Happy Birthday!! What a pretty shot and Happy Birthday! May your birthday be blessed and magical! The French Quarter is my favorite resort that I have stayed in so far. I loved it! Aww!! Perfect for February!! 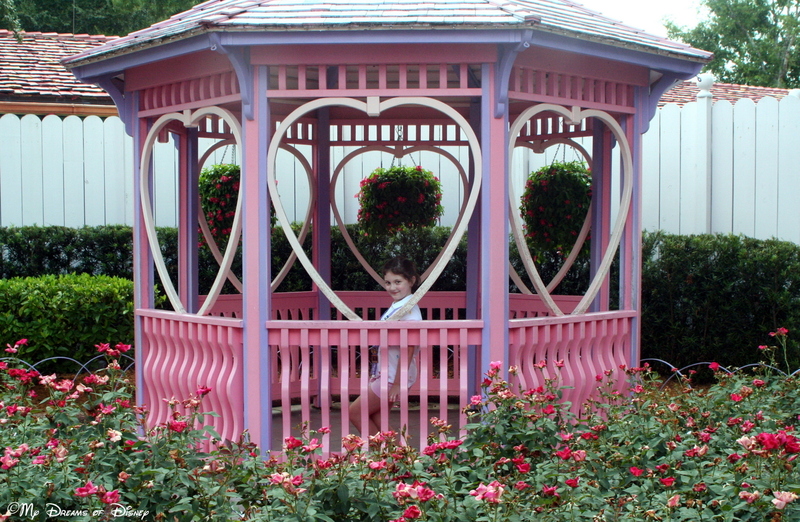 And I miss that sweet little gazebo. Previous Post: Tiggerific Tuesday Trivia – Steamboat Willie! Next Post: Friendship Friday – My buddy Elisha!